The following sections describe mixed-integer programming (MIP), also called mixed-integer linear programming (MILP). Note: To use a third-party solver other than CBC, you must install it and then build OR-Tools from source. The following shows how to use the MIP solver CBC in C++. Using other MIP solvers is similar. Declare the linear solver wrapper. Call the solver wrapper with the argument CBC_MIXED_INTEGER_PROGRAMMING, which tells it to use CBC. The input is passed to the solver wrapper through the OptimizationProblemType method. Declare the solver using the Python wrapper pywraplp. Note that this also passes the argument CBC_MIXED_INTEGER_PROGRAMMING to the solver. You don't need the CBC_MIXED_INTEGER_PROGRAMMING argument, as it's already bundled with the solver. Since the contraints are linear, this is just a linear optimization problem in which the solutions are required to be integers. 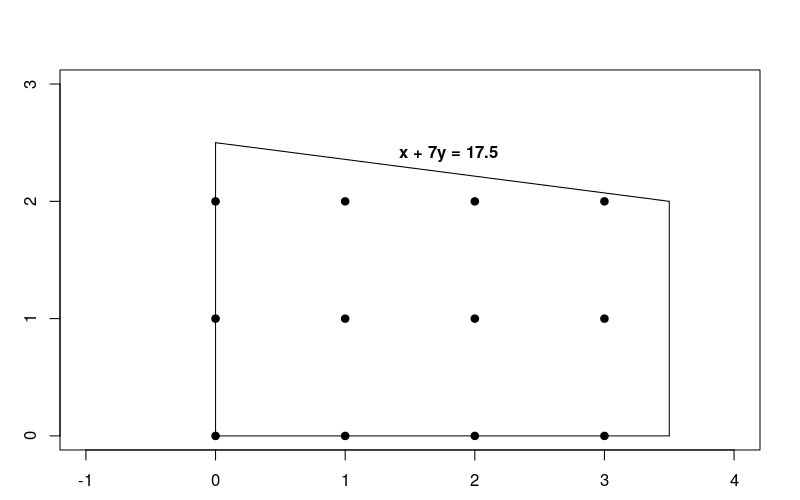 The graph below shows the integer points in the feasible region for the problem. Notice that this problem looks quite similar to the linear optimization problem described in Linear Optimization with Glop, except for the integer conditions. Fortunately, you can easily modify the linear optimization Python program, described in that section, to solve this problem. All you have to change (besides the constraints and objective function) is the solver and the types of variables defined. The following sections present the main elements of a Python program that solves the integer problem. The following code defines the variables in the problem. # x and y are integer non-negative variables. The program uses the IntVar method to create variables x and y that can only take on integer values. Note: This differs from the linear optimization program, which uses the solver.NumVar method to create variables that can take on any real number values. The following code defines the objective function for the problem. # Maximize x + 10 * y. The SetCoefficient method sets the coefficients of the objective function. The SetMaximization method makes this a maximization problem. The following code declares the solver for the problem. The program uses the Python wrapper pywraplpto create an instance of the CBC_MIXED_INTEGER_PROGRAMMING solver. # The problem has an optimal solution. # GLOP_LINEAR_PROGRAMMING, verifying the solution is highly recommended!). The optimal value of the objective function is 23, which occurs at the point x = 3, y = 2. Finally, here is the entire Python program. """Solve the problem and print the solution.""" 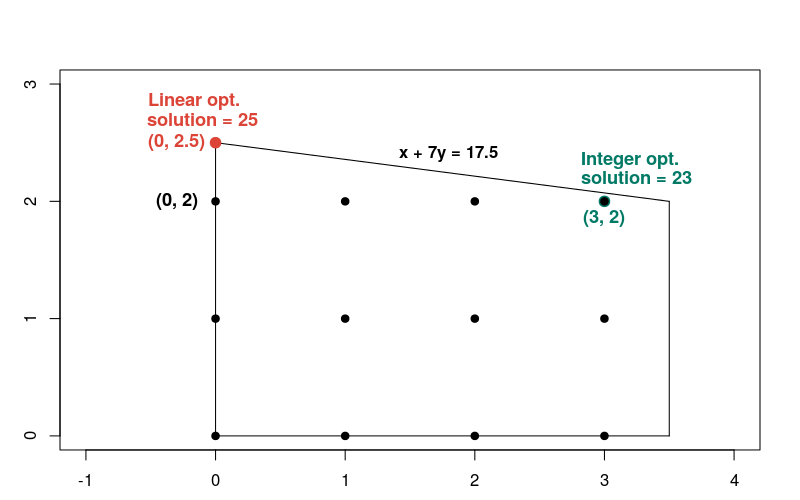 Let's compare the solution to the integer optimization problem, shown above, with the solution to the corresponding linear optimization problem, in which integer constraints are removed. You might guess that the solution to the integer problem would be the integer point in the feasible region closest to the linear solution — namely, the point x = 0, y = 2. But as you will see next, this is not the case. The solution to the linear problem occurs at the point x = 0, y = 2.5, where the objective function equals 25. Here's a graph showing the solutions to both the linear and integer problems. Notice that the integer solution is not close to the linear solution, compared with most other integer points in the feasible region. In general, the solutions to a linear optimization problem and the corresponding integer optimization problems can be far apart. Because of this, the two types of problems require different methods for their solution.